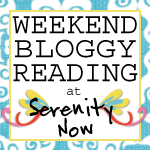 Serenity Now: Hey, Big Spender(s)! 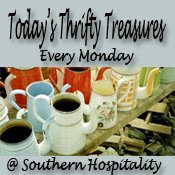 It's Thrifty Treasures Monday over at Rhoda's! a) She could help me schlep the girls all over this side of town. Furthermore) It's way more fun to go yard saling with a friend. My only demands were that we had to try and leave the house by 8 am before all the good stuff was gone (it's super hard to get out of the T house any earlier with two little ones) and that we stop for coffee at some point. Well, coffee for her, a café mocha for me, and a donut hole for each girl. As you can see in the photo below, Su-Su was stoked that I brought my camera along for blogging, as she decided not to wear make-up due to the ungodly hour I made her show up on L Avenue. Natalie and Michaela Byrd got strapped in and ready for a morning of good, old fashioned, cheap fun! After hitting a few sales (man, is it nice to have an extra person to help get kids in and out of carseats! ), we decided to run over to the Salvation Army up the road. Here's Natalie dancing for joy in the SA parking lot. She found some treasures of her own! Got this copy of The Lion King for 50 cents at our very first yard sale of the day. We have a VCR/DVD combo in the family room, so I stock up on super cheap VHS tapes when I see 'em. The couple selling this Better Homes & Gardens Making a Home book was asking $1.00 for it. On a whim, I offered 75 cents, and they agreed. I was a little suprised. 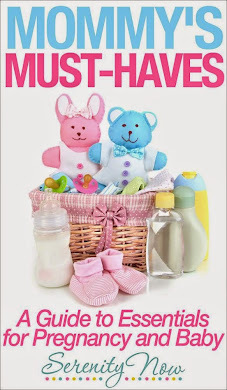 The publisher's price is $30.00, and it's filled with all sorts of household tips, lists, and goodies. Brand-new! It killed me to pass up this wicker love seat. It was in great condition, and just needed some TLC. I think Salvation Army was asking $30. At Salvation Army, Natalie found this old Little Bear book, Madeline (!!! ), and a couple of Berenstain Bears books that she and Michaela Byrd don't have. They were 25 cents apiece. This is why she was dancing for joy as pictured above. At one sale, the home owner said she wanted $5 for this slate. (I hang others like these outside on the brick wall by our front door) I offered $1 and we settled on $2. I think I want to paint it black and stencil a pretty pattern on it. The table pictured above was Su-Su's first buy of the day. She agreed on the full asking price of $1. I told her I thought it would be a great little side table in their guest room. I've seen the table cloths to go on those in Target for pretty cheap. The lamp pictured above was what I'd call the "steal" of the day! I spotted three of those babies from the road, and that's what made us pull over for that sale. The others were broken, but this one was in a pretty good state. Su-Su hasn't been yard saling in years, so she was a little nervous about haggling. I told her I thought anything close to $10 was too much. When the owner told her she'd let the lamp go for $2, plus the shade, I almost squealed with joy! Here's a close-up of the details on the lamp. I think it will be so cute dressed up with a new shade. The current one is pretty ratty and stained. Ick. So not bad for one morning! I think our grand total together was somewhere around $8. We are big spenders, huh? Tune in later this week to see how we fared at IKEA on Sunday!!! I love The Lion king but I hate the part when Simba gets older and when his dad dies. When I watched that movie, I would only see the beginning part. I hate it when they make them sad like this. They should know that it can make kids cry. you got some great deals. I've found thrift stores have some great books for very little money. Awesome! Looks like you ladies had a great time this weekend! You found some really great deals! It must have been hard to pass up that wicker loveseat. Don't know if I would've had the strength! Looks like fun! Nothing like a day spent thrifting. Oh and I hope the spot on your back turns out ok. It's always scary when we get stuff checked out. Wow, sounds like you guys had quite a bit of fun on your yardsaling adventure. Great deals! That lamp looks like it's going to be fab. *Oh, and I have that same BH&G book, it's great! Awesome finds, especially that little table. I am kicking myself for passing up one of those a few weeks ago. It was probably three times that size and $5. Woulda, coulda, shoulda! Can't wait to see what you got at IKEA. I was lucky enough to go to one on vacay and am LOVING my IKEA treasures! You both did good. Isn't it fun that it doesn't take much to get little ones to dance for joy. sometimes not much for us, too. Bargain lamp, for instance. Happy Thrifty Monday. Congrats on such great finds! It's so much fun to go with someone else, isn't it? You don't necessarily need a table cloth to go on top of that little table. I have one in my bedroom (it's ugly, but was free!) that I covered with a shower cutrain that was on clearance for next to nothing. Hi and Hello from TX. I just joined Rhoda's party and am having lots of fun visiting several of the blogs that are participating. I love the LAMP! What a great find! Great finds you big spenders you! And I had to laugh at you haggling over $1, down to 75 cents. Shameless, LOL! Glad ya'll had some fun. LOVE the lamp! I sooo want to go yard saling! Haven't ever done it! But it is in my plans for this summer!!! Hope you've had a wonderful Monday! Sorry I'm just now getting over here to your TTT post. What an adorable little lamp. Looks like you got some stuff.